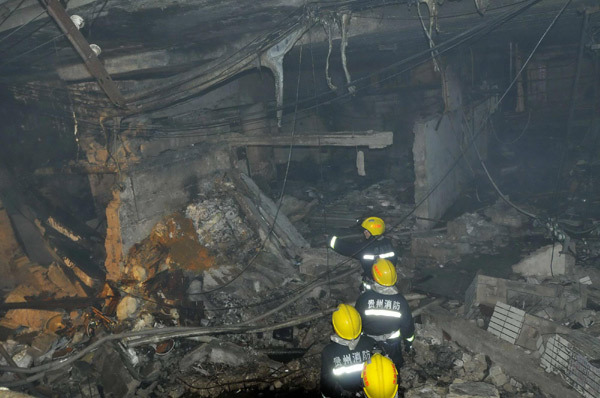 GUIYANG - Seven people were killed and 37 injured in an Internet Cafe when chemicals exploded in an adjacent shop Saturday night in southwest China's Guizhou Province, local authorities said Sunday. The explosion happened in a shop where sodium nitrite and other explosive chemicals were stored. 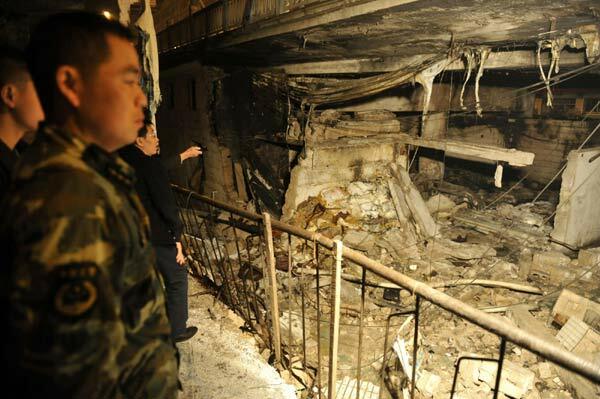 The 11:05 pm blast and ensuing fire completely destroyed the next door Internet cafe in Kaili City, Qiandongnan Miao-Dong Autonomous Prefecture, said a spokesman with Kaili municipal government. Six people were killed on site and one woman died of extensive burns after treatment failed Sunday afternoon in hospital. Police have detained Wu Zhanzhi for illegal possession of chemicals. The Internet cafe's boss Chen Chenggui and manager Xing Guangchang were also in police custody for questioning. Forty-five people were in the cafe when the explosion occurred. Only one of them was not injured. The rescue work had ended, and the 37 injured, including 8 seriously, were being treated in local hospitals. A statement from the Kaili municipal government said the injured people were in a stable condition. Long Xianze, deputy head of Qiandongnan Miao-Dong Autonomous Prefecture Hospital, said the seven seriously injured people the hospital admitted were out of danger. The most seriously injured suffered burns over 35 percent of his body. "I was chatting online when the blast knocked me over. I pushed away a wreaked desk that had landed on me and managed to climb out," said 18-year-old Long Jiuke, who was being treated in the hospital. "The ceiling fell down after the blast. Someone pushed me down in the chaos, others stamped on me," said a female student of Qiandongnan Prefecture Middle School, who declined to give her name. She had burns on her face. The investigators are presently identifying the bodies of the dead, one of whom was a child. Xinhua reporters heard that middle school students were among the injured. But it was not immediately clear how many children were among the casualties. Internet cafes are not allowed by law to receive people under 18 years old in China. Aside from ripping through the Internet cafe, the blast also shattered windows of nearby residential buildings. The Internet cafe, with 140 computers, had been operating with a license for a number of years, police said. A further investigation is underway. "The location and environment of the Internet cafe is not safe. We will find out who approved its operation and who was in charge of safety supervision. They will be held responsible," said Li Feiyue, head of Qiandongnan Miao-Dong Autonomous Prefecture.